Successfully Added Matlock Senior Citizens China Cell Phone to your Shopping Cart. The Matlock China Cellphone specially designed for senior citizens, big men, and kids. 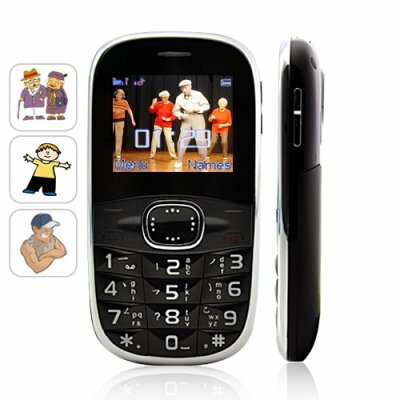 It's an unlocked dual SIM, quad-band GSM world phone with bigger writing, bigger keys, and text to speech! Senior Citizens: Just what the doctor ordered. The Matlock China Cellphone features jumbo sized keys to make dialing easier. Perfect for people with arthritis, rheumatism, or poor eyesight. This safe phone also has text to speech key confirmation for those of us who are hard of hearing. Instead of hearing tones when you press keys, a pleasant female voice reads out the numbers you're dialing. Finally, The Matlock China Cellphone also comes with an SOS button on the back of the phone which immediately dials your local emergency number. Big Men: You've got jumbo sized fingers which is a nightmare when it comes to pressing those tiny keys on those normal mobile phones. This baby has jumbo man-sized keys for your man-sized hands. What's more, The Matlock China Cellphone has everything you need and nothing you don't. It's a simple to use dual-SIM, quad-band GSM phone with just the right amount of essential features for real men! Small Kids: The perfect cellphone to keep in your son or daughter's knapsack in case they need to reach you for an emergency. It's got big keys to make calling easier for them. What's more, because of its low price, even if they lose it, you're out 50 dollars versus those more expensive phones! The Matlock China Cellphone is the perfect kid's phone. This is the perfect resale item. Buy it from us for less than 50 dollars then resell it for 80 dollars. That's a 60% easy profit! Brought to you by the leader in online direct from China wholesale electronics and dropshipping - Chinavaison. Can speak incoming telephone numbers! NOTE: This product is compatible with all four global GSM frequencies (850MHz, 900MHz, 1800MHz, 1900MHz) and can be used throughout the world. Please check that your local cellular network matches this phone's GSM standard. When you receive a call, you can set it so the cellphone speaks the incoming number aloud. SIM 1 incoming ring tone, SIM 2 incoming ring tone, Power on tone, Power off tone, SIM 1 message, SIM 2 message, and the Keypad tone can all be changed. Intelligent call answer function available which reads the incoming call number aloud before playing the appropriate ring tone. Why is this phone called Matlock? Because it's intelligent, practical, and a hit with senior citizens! Because we took out all the technogadgetry that senior citizen's, tough guys, and small children don't require and just left in the essentials. What is the default phone password? Can I change the ringtone for each caller? Not for each caller. But this phone allows you to group your callers into one of 5 groups. Each group can have its own ringtone.